Table 1: Traffic impact comparison of conventional and SPMT construction methods. The Federal Highway Administration (FHWA) provides high-quality information to serve Government, industry, and public in a manner that promotes public understanding. Standards and polices are used to ensure and maximize the quality, objectivity, utility, and integrity of its information. FHWA periodically reviews quality issues and adjusts its programs and processes to ensure continuous quality improvement. This manual contains information on the equipment, benefits, costs, project selection criteria, planning, design, contracting issues, and example contract documents for using self-propelled modular transporters to move bridges. It also includes case studies and lessons learned from previous projects. The manual is intended for use by bridge owners, construction contractors, suppliers, and other professionals involved in bridge design and construction. The development of this manual was sponsored by the Federal Highway Administration (FHWA), the American Association of State Highway and Transportation Officials (AASHTO), the National Cooperative Highway Research Program (NCHRP), and the Florida Department of Transportation. The manual was requested as part of the Scan Technology Implementation Plan following the 2004 FHWA/AASHTO/NCHRP International Scan on Prefabricated Bridge Elements and Systems. 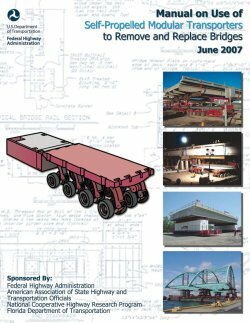 The use of self-propelled modular transporters (SPMTs) for bridge moves was the top implementation recommendation of the 2004 Prefabricated Bridge Elements and Systems International Scan sponsored by the Federal Highway Administration (FHWA), the American Association of State Highway and Transportation Officials (AASHTO), and the Transportation Research Board's National Cooperative Highway Research Program (NCHRP). The purpose of the scan was to learn how other countries use prefabricated bridge components to minimize traffic disruption, improve work zone safety, reduce environmental impact, improve constructability, enhance quality, and lower life-cycle costs. The scan team learned that European countries frequently use SPMTs to lift and drive bridges to their final location in just minutes. SPMTs are computer-controlled platform vehicles that can move bridge systems weighing up to several thousand tons with precision to within a fraction of an inch. The prefabrication of bridges offsite under controlled conditions followed by rapid installation onsite can achieve quality installations with traffic impacts of minutes to a few hours compared to the months typically required for conventional onsite bridge construction. The significantly reduced onsite construction time when using SPMTs to move prefabricated bridge superstructures, for example, is due to the collapse of the sequential processes of conventional onsite bridge construction to just one step: moving the prefabricated superstructure from the staging area to its final position. This technology should be considered for all bridge replacement projects where reduced onsite construction time is a priority. The manual provides details from project conception to completion for using SPMTs to remove or install a bridge. It describes equipment, lists benefits and costs, and identifies criteria to determine when this technology is appropriate. It also addresses planning-related issues such as traffic considerations and site requirements. Design issues discussed include temporary shoring and prefabrication requirements, allowable temporary stresses and deflections during the move, and possible design efficiencies because of offsite prefabrication. Contracting issues covered include staging area requirements and contracting strategies for reduced onsite construction time. Also included are various example calculations, diagrams, plan sheets, and specifications for use as a starting point for upcoming projects using SPMTs to remove or install bridges. Case studies of bridges moved with SPMTs are also included; the 2006 Florida Department of Transportation I-4/Graves Avenue bridge replacement project is covered in detail, and several other projects are summarized. Using this manual in combination with the FHWA decisionmaking framework and analysis of delay-related user costs should provide the guidance that bridge owners and other bridge professionals need to understand the technology, determine whether using SPMTs will benefit a specific bridge project, and develop contract documents that incorporate the technology.